This is defined as a defect found within the bone mineralization as a possible result of many things; vitamin D deficiency, phosphate deficiency, an inherited hypophosphatasia deficiency or agents that can have adverse effects on the bones. 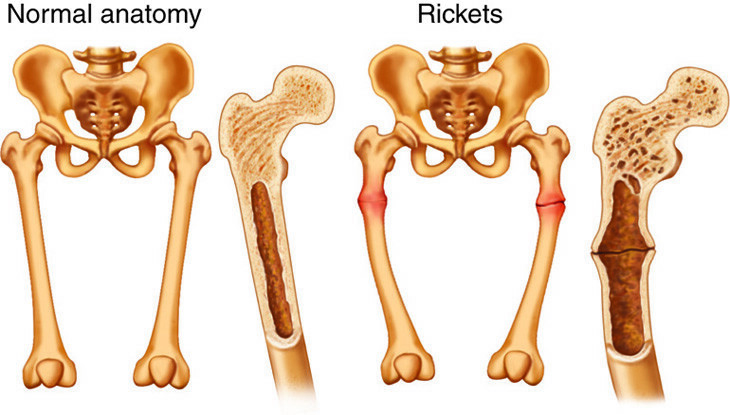 Osteomalacia is the softening of bone typically caused by a severe vitamin D deficiency. The soft bones in both children and young adults can result in bowing during the growth stage, especially in the bones that carry weight. Osteomalacia in adults can result in fractures. Much to the surprise of many, a lack of calcium in ones’ diet hardly results in osteomalacia. The more common reason behind the condition is a deficiency of vitamin D, which is brought upon by factors like increased sunscreen use, decreased exposure to sunlight and the limited consumption of vitamin D sources. Those with darker skin, or more melanin, are especially at risk as they react to sunlight differently from those of a lighter skin tone. The most common source of vitamin D is milk but with only 100 IU/cup of milk, it is not easy to achieve the recommended 400 IU/d of vitamin D. Other foods that have been fortified with vitamin D supplements include cereals. Other than an insufficient intake, malabsorption of the vitamin could also be a reason for the deficiency. 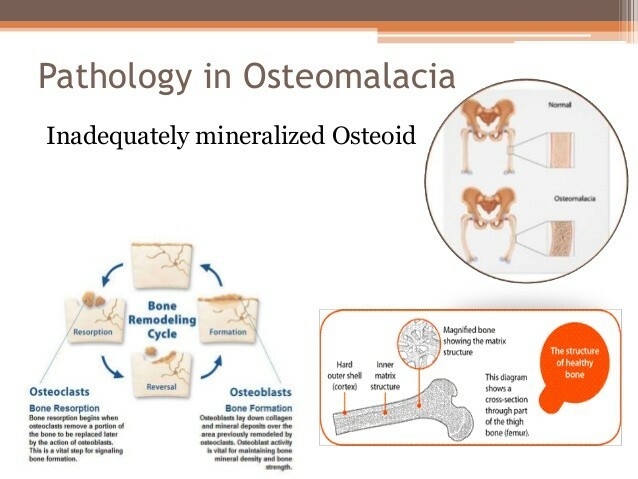 Osteomalacia is different from osteoporosis, bone thinning, and having a low vitamin D level. Treatment of osteomalacia simply involves the consumption of more vitamin D and calcium in order to strengthen the bones and treat any underlying issues possibly causing the condition. The symptoms of osteomalacia may not show up in the early stages but could be visible through an X-ray or a diagnostic test. As the condition progresses and worsens, you may feel pain or your muscles weakening. The aching pain usually associated with the condition will usually affect areas like the pelvis, back, hips, legs and ribs. The pain typically gets worse when pressure is applied, at night and will not go away even with rest. Walking becomes slower and more difficult due to the decrease in muscle tone and increases in weakness. 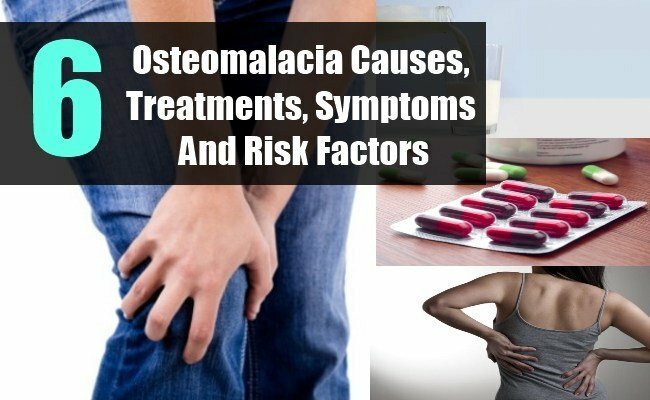 Osteomalacia is caused by a defect in the process of bone maturing. Calcium and phosphate are used by the body for strong bone building and if a person doesn’t get enough of it, the body might develop the condition. Here are some possible causes of the condition. Sunlight produces vitamin D within the skin. Those who live in areas that receive little sunlight or consume a diet low in the vitamin are at risk of developing the condition. Vitamin D deficiency is also the most common cause of osteomalacia worldwide. In the stomach, food is broken down to release minerals and vitamins to be absorbed in the intestines. Should any part of the digestive system be removed, the digestive process is disrupted and can result in a deficiency of vitamin D and calcium. Bypass surgeries done to the small intestine can also lead to the same consequences. This is an autoimmune disorder that can result in damage to the lining of the small intestines due to consumption of gluten found in wheat, barley and rye. A damaged small intestine does not absorb the nutrients well and can cause a calcium and vitamin D deficiency. These are the organs responsible for activating vitamin D in the body. With these organs down, the body’s ability to make active vitamin D is compromised. Drugs used to treat seizures, like Dilantin and Phenytek, have the ability to cause severe vitamin D deficiency and osteomalacia. Those who at the highest risk of developing osteomalacia are those who have both an inadequate intake of vitamin D and little contact with sunlight. Examples of such people include those who are bedridden, hospitalized or housebound. Those who suffer from the condition are at risk of breaking bones in their ribs, legs or spine. Prevention is always better than cure. 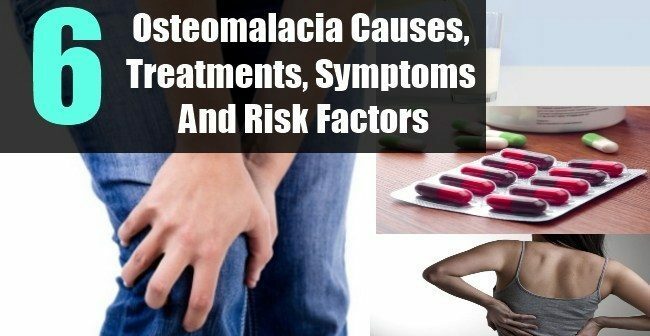 Osteomalacia is caused by a lack of vitamin D so the easiest way to combat that is through getting sufficient vitamin D. Eating foods high in it is an option and such foods include egg yolk, sardine, bread, milk and yogurt. Should the need for them arise, you can take supplements for whatever vitamins and minerals your body is lacking. However, do consult a doctor first before going ahead with taking any pills.